Our Labeling Robotic Workplace ERP is designed to label, verify and pack the products into boxing packages. The SW application is customer made to the needs of the customer. Product labeling ensures accurate and fast applicator Collamat, verification of printed information and checking the accuracy of the product is performed by vision system Omron Microscan and folding into specific packaging boxes is done by a FANUC robot. Almost every work processes in one place! The ERP workplace is designed to: print and label the product, verifying the correct position of the product label, verification of product and label assignment accuracy, establishing properly labeled products in the stack in a preset quantity, disposal of non-compliant products. How does the device work?. Assignment for production is done on the control panel. The application cycle starts when the operator places the products on the conveyor. Part of the solution is the accurate Collamat Label Applicator, which is supplemented with a perpendicular piston for proper label application. The top and bottom positions of the applicator piston are reliably indicated by the sensors. The application head is equipped with a rubber coating for good label affixation, and easy insertion of the labels in the applicator allows the bushing tube. Once the label is loaded and printed on the product, the next step is to verify the accuracy of the label data and to check the accuracy of the product using the Omron Microscan or Keyence camera system. 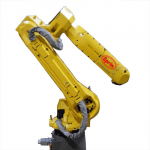 The latest part is FANUC's robot arm with a sophisticated Savvy system that transmits the product to the packing box on the line. M-20iA – nejvyšší nosnost a moment setrvačnosti ve své třídě. With a handling capacity up to 20kg and a reach up to 2009mm makes the M-20 series, ideal for all applications to handle medium payloads. Technical parameters of this unit excel in especially in the highest value of axis speed and acceleration cycle time of 0.72 s (at 6 kg load capacity, runway 25 mm/25 mm/300 mm) to move the moving pick & place. Basic use: Machine load/unload operations Material handling for assembly, plastic moulding Cutting, grinding, deburring and polishing Packaging - Picking Glueing and sealing Ease of integration Ideal for loading and unloading of workpieces Possible high-level moments and moments of inertia on the wrist for complex assembly tools Tools can by used at high speed.